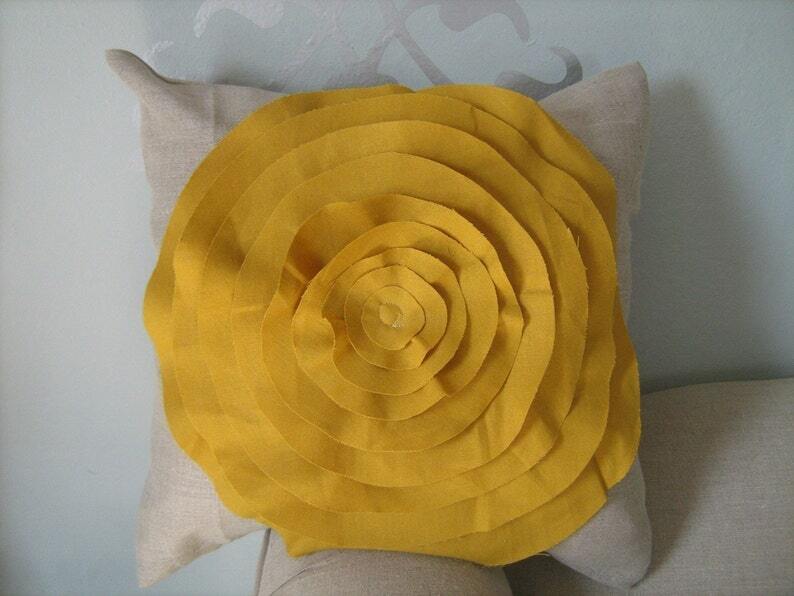 14x14 gorgeous linen pillow cover in a beautiful oatmeal/natural linen and a big mustard yellow rose. Comes in larger sizes of 16x16 and 18x18 for a few dollars more. Convo me if interested in setting up a listing for one! Inserts are available. Envelope back. Asked why I haven’t gotten it, no response from seller. Do not order from this person! I ordered one small pillow over 2 months ago and just received it. I tried countless times to contact her requesting a refund (or a response), once I escalated the problem to Etsy she then shipped the pillow. I’m beyond disappointed with her lack of communication or timeliness and will never order again. Save yourself the frustration, it’s not worth it! Nice Pillow! Took way too long to receive. I will accept paypal, check, or money order. Once payment has been recieved and cleared, your item will be made, in line with the orders recieved. I like paypal payments to be paid within two days of purchasing an item. After two days, I will send you a "reminder" and two days later, if you have yet to pay, I will have to cancel the sale. Sorry! The item usually can be bought again, just convo me and we can work it out! Check or money orders, please pay within 7 days! THANKS!! ALL SALES ARE FINAL. Please understand that I cannot take returns on items. Once they are sold and used I cannot re-sell them and therefore cannot refund you. Sorry! I do not accept refunds for custom orders either. (sorry again!) I also do not take responsibility for loss or damaged items in the mail. If you would like to track or insure your item, please let me know BEFORE purchasing and I will adjust the price for insurance! I package with care to help prevent loss or damage! I WILL ship internationally, just convo me for a shipping price and I will be happy to work with you, no problem! Most items ship within 2-4 weeks but custom orders may take longer to make and ship. Multiple orders may take a bit longer. It really all depends on how many orders I recieve that week. If you need an item quickly, please ask and I am positive we can work something out! Also, if you want insurance on an item, please ask before purchasing so I can add that in! Thanks! I welcome custom order for the items listed or for some idea you might have that I don't have in my shop! If you would like a pillow, for example, in a different color just let me know and I will be happy to make it for you! If you would like something special, just ask and I will work with you on getting you that item the way you want it! WHOLESALE*** please contact me for wholesale! I have a few accounts and would love to talk with you about one!! THANKS!! ***If you would like a pillow cover only, convo me for that too- or put it in note to seller, along with the size!